New perspectives lead to new, groundbreaking discoveries. That’s why Mayo Clinic and the Center for Individualized Medicine support young investigators and the fresh thinking they bring to research. Thanks to the Gerstner Family Foundation’s support, Betty Y.S. Kim, M.D., Ph.D., a neurosurgeon and neuroscientist at Mayo Clinic’s Florida campus, led a study that developed a new way of shrinking breast tumors with particles so small that you can only see them with a microscope. In the medical and scientific worlds, they are called nanoparticles. In the study, published in Nature Nanotechnology, mice that received an injection with these microscopic particles showed a 70 to 80 percent reduction in tumor size. Most significantly, mice treated with these particles showed resistance to future tumor recurrence, even when exposed to cancer cells a month later. "The Gerstner Award has had a tremendous impact on my career development. 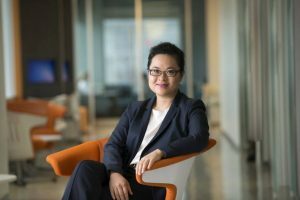 The award provided me with critical resources and support necessary to balance my clinical responsibilities as a neurosurgeon, while conducting innovative translational research that may one day advance the field of medicine," says Dr. Kim. Learn more about the study in this news release. Dr. Kim is a recipient of the Gerstner Family Career Development Award in Individualized Medicine, an award established by the Gerstner Family Foundation to provide early career investigators important seed money to conduct research to predict, prevent, treat and cure disease using individualized medicine approaches.